* Once again, although this set was given away with a minimum spend of GBP 50 during the Brick Friday event(s) and S@H's online promotion, the set was valued at GBP 9.99 on the receipt. 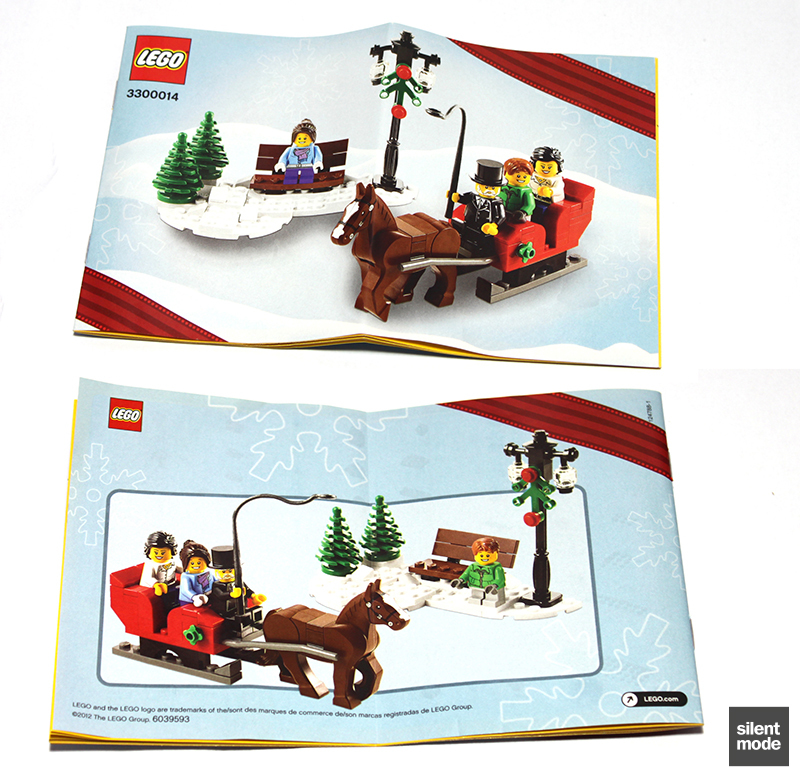 Welcome to another SilentMode review, and this time we’re going to be taking a look at this year’s promotional “holiday” set. Almost a year ago we came across the infamous Holiday Set 1 and 2, as well as the impromptu birth of EvilMode. This year’s “holiday” set – although I’m going with the name Christmas Set – is more expensive and slightly larger than its previous counterparts. How will it fare? The first thing you’ll see is that the box design screams “exclusive”, if not “premium”. It has a really nice colour and design to it, and like last year’s sets it matches the general look of their in-store promotions (except not so much green). I almost don’t want to open the box. On the other hand, the back – while keeping the luxury colour scheme going – is a little plain. It does, however, show the other side of the sleigh, while letting the young girl and boy switch places. The long sides of the box have the usual information about where the sets were assembled and manufactured. Chinaphobes will be pleased to know that they had nothing to do with this set – or so we’re told. Also there’s a small reminder: outside of the Brick Friday event(s) and the current online promotion, you can’t get hold of these (unless someone kindly sells one to you). 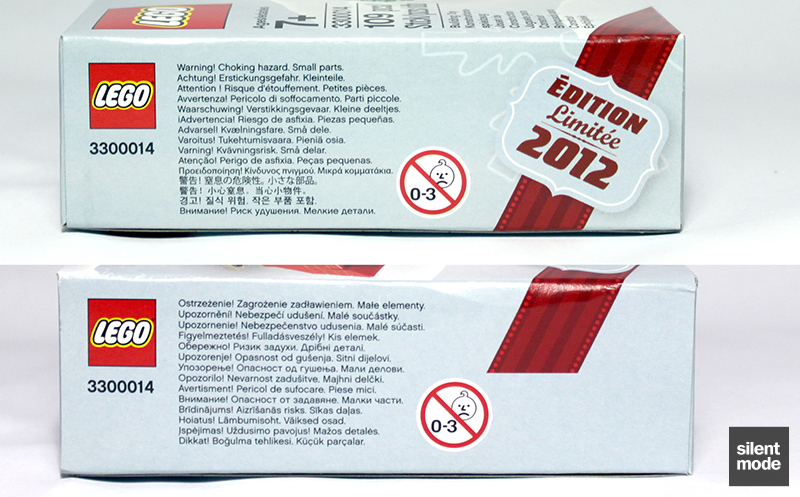 The short sides have the obligatory reminder, in three hundred different languages, that there’s a choking hazard once the box is opened. Interestingly enough, although I may have missed it before, this is the first time I recall seeing a “sad onion” on a box of LEGO. 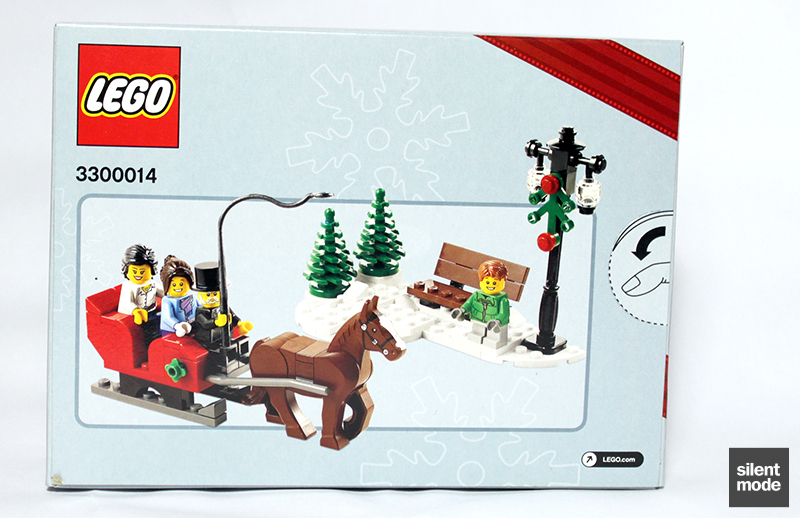 Probably the most noticable thing in this set is the inclusion of the prancing horse, which doesn’t quite have the impact of the 1×1 round tiles that made their debut in Holiday Set 2 (you know, the piece that automatically made that set better than Holiday Set 1). Other than that, there are two bags of parts, the crisp instructions folded in two, and a very hard to see 4×12 plate in White. These are a few of the parts in White available in this set, most notably the 4×12 plate and the three quarter circles. Interestingly enough I’ve spent most of the year getting rid of my Red parts, simply because I don’t have a use for them. 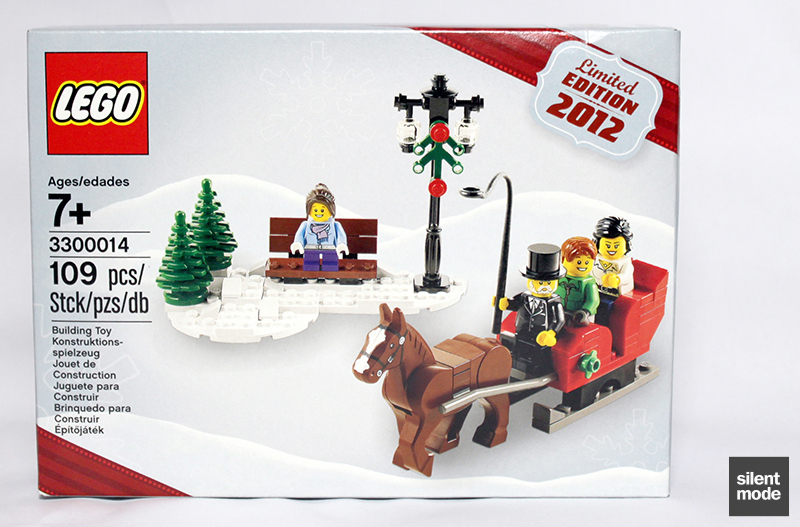 This set ironically features most of its parts in Red, mostly for the sleigh. 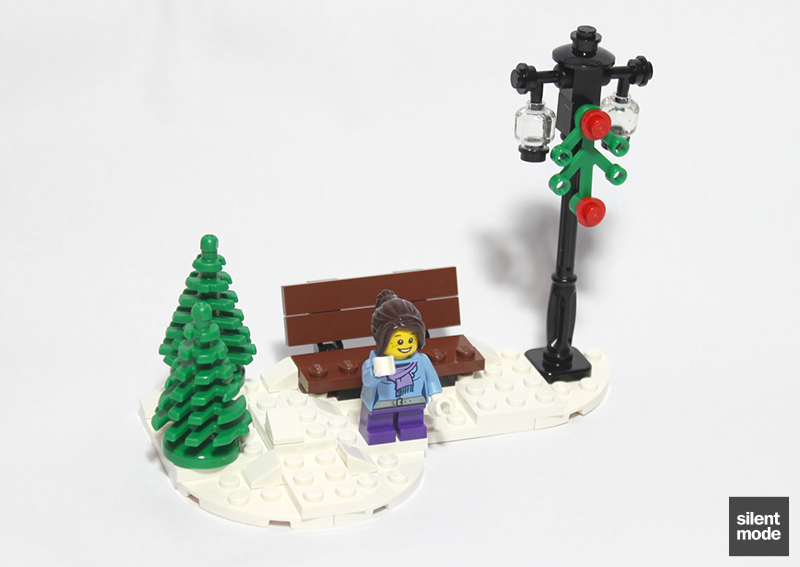 For anyone who couldn’t get hold of the previous three Winter Village sets, you’ll be pleased to know that the set comes with a black lamppost. I like these, although I’ve not really put them to any use yet. But besides that, there are a few very useful plant parts included in the set, perhaps just not enough of them! Watch out for that leafy part (at the front) next year, where it will be making an appearance in this year’s Olive Green (and perhaps other colours). For the cheese slope lovers we get nine of them in white, as well as a few in Dark Bluish Grey and Red, and even a couple of doubles in Red. 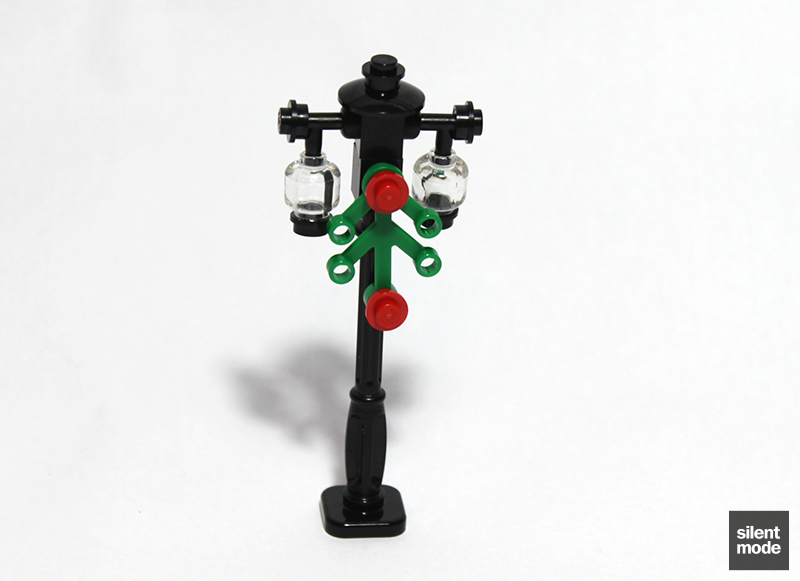 We also get two transparent minifigure heads for the lamppost, but sadly not much in the way of tiles. Very generously, for a set this size, we’re given four minifigures to play with. Of the most value are the torsos for the children: the Bright Green jacket only appearing in last year’s City Advent Calendar as well as this year’s Winter Village Cottage, and the Medium Blue jacket appearing in the Winter Village Post Office as well as the Cottage. Both higly desirable torsos in my book. I can’t help but be a little concerned – and this is something I had an issue with in the Winter Village Cottage – that whomever at LEGO decided to give a young girl boobies. 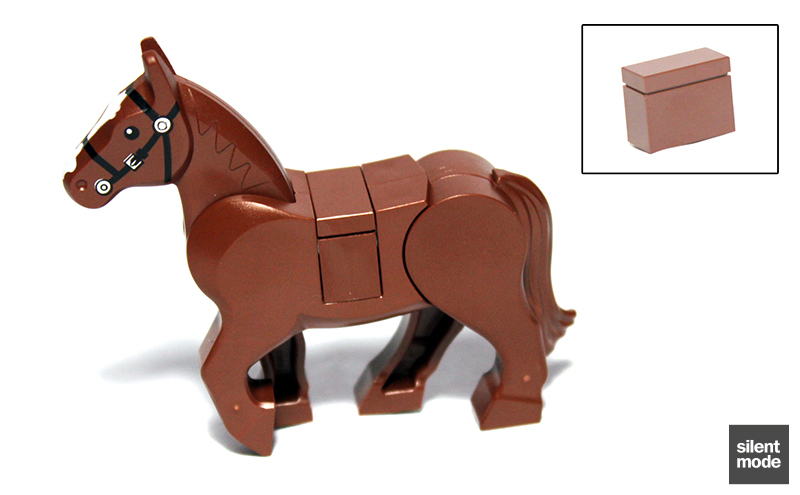 This is actually the first time I’ve gotten hold of the new minifigure-scale horse, which was introduced in the Lord of the Rings theme. For those who don’t know: this new horse has the ability to rear (stand on its hind legs), while still looking similar to the old-style horses. One other difference is that both the neck and back legs “snap” into place. 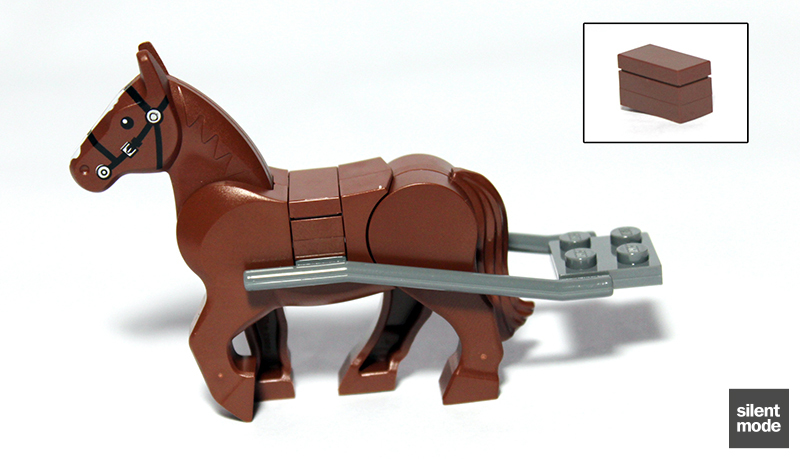 Anyway, the set makes it possible to display the horse on its own, by providing a 1×2 brick to place inside it (as shown above). 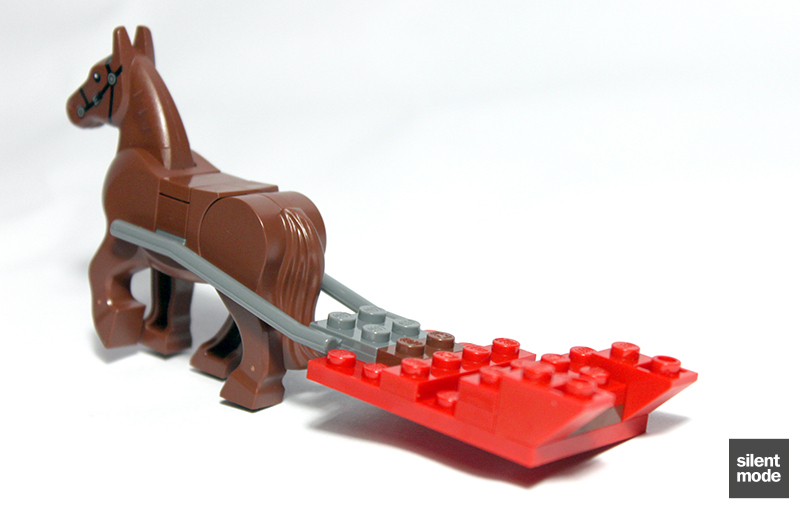 For the assembly of the set – the horse pulling the sleigh – we require two 1×2 plates mounted on top of the grey piece, as shown here. 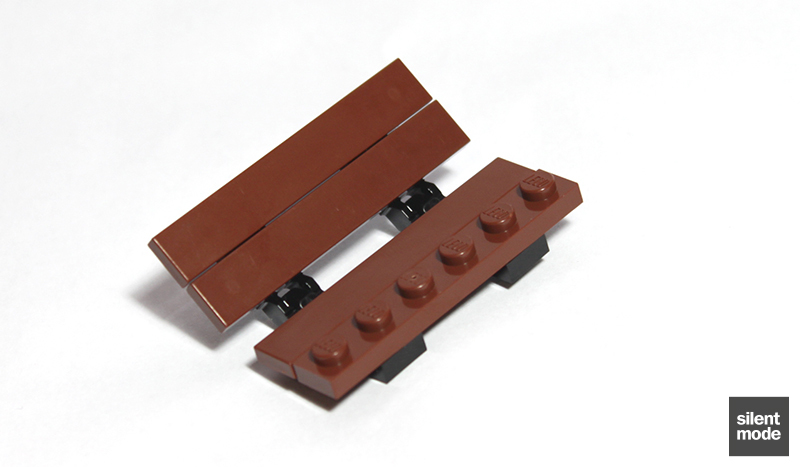 One issue I have with this feature is that the set only includes one 1×2 tile, which means it will have to be switched between the plates and brick. This means a greater likelihood of losing the tile, resulting in an incomplete horse, if we’re not careful. In a twist of events, we’re actually going to build the main part of the set first. 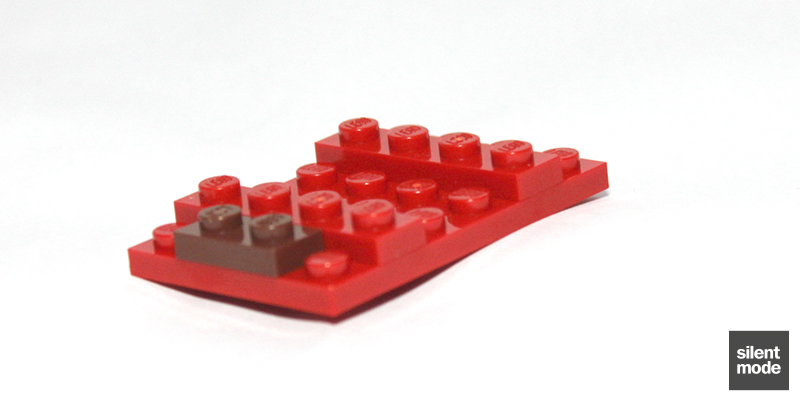 The base of the sleigh is the 4×6 Red plate, with some other smaller plates to get the shape going. I’ve actually attached the front two plates incorrectly in this picture(!). 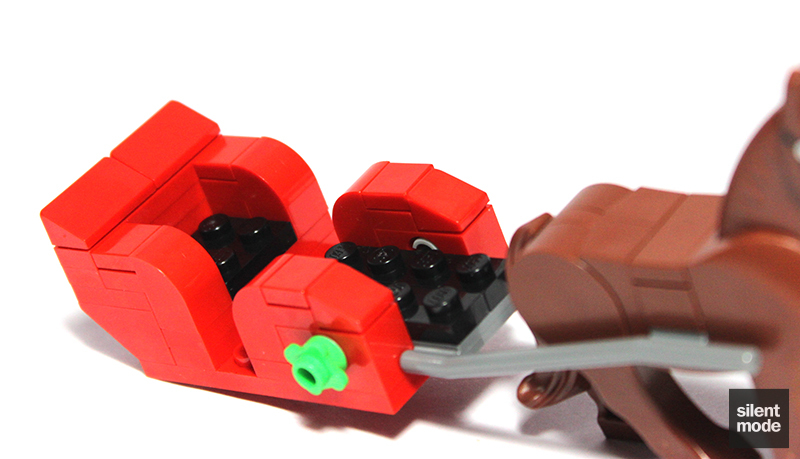 Because I was too lazy to disassemble the horse from the previous photo, here’s the next stage of the sleigh attached to the horse. If it wasn’t so unstable, it might actually be fun to ride this way. 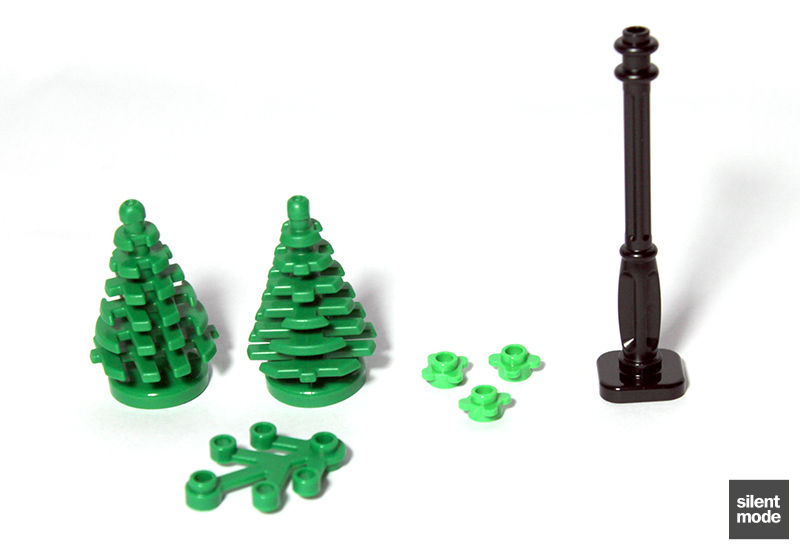 This assembly, using the Technic parts and a Bright Green flower plate, form the decorations for the sleigh. Possibly the equivalent of “go faster” stripes. We’re virtually done with Red as the finishing touches to the sleigh are added. 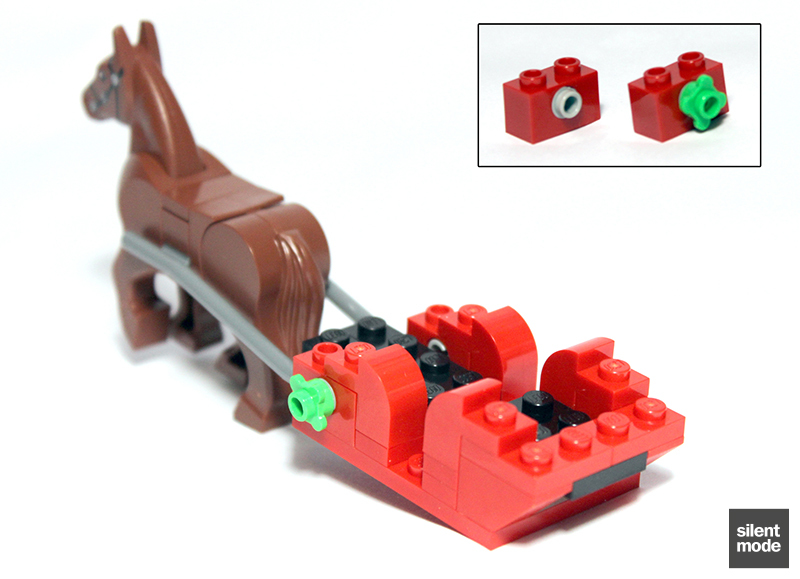 The horse is starting to buckle under the pressure – we’d better add some supports! Well here they are. I had been thinking that, while it may have been too much to bring back the Technic ski parts (as in Ice Planet), these look a little too basic for my tastes. What are the alternatives though? Here’s the complete sleigh along with a very relieved horse. I’ve actually forgotten to add one part at this point, namely the 1×2 Red panel that separates the passengers from the driver. 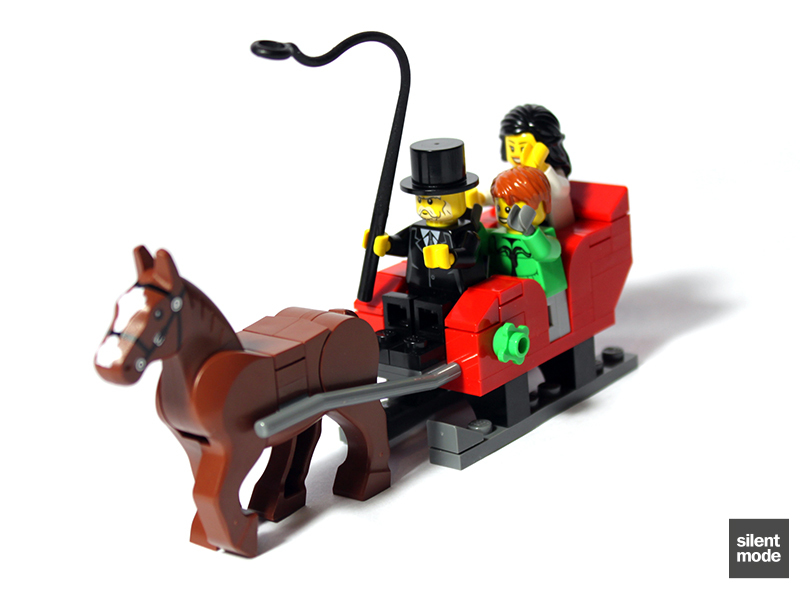 As pictured in the set, here’s a rather pleasant vision of a one-horse open sleigh, complete with privileged single mother and child, and a driver cracking a whip. There really must be something going on with the presence of whips in Winter sets: stay tuned for the 50 Shades of Light Bluish Grey Winter Village set. All of the White plates and cheese slopes – as well as the brick – go into making this patch of scenery to accompany the sleigh. Using the remainder of the Reddish Brown parts, this tried and tested bench design is assembled. 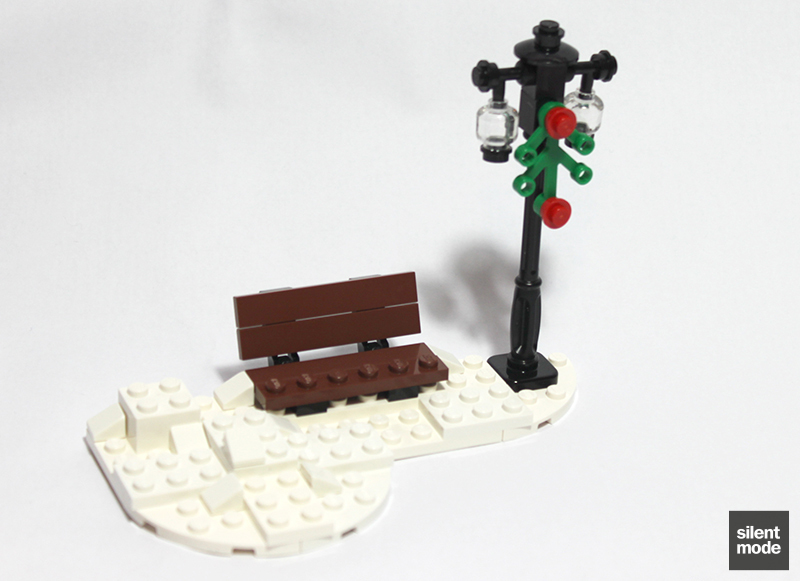 In addition to the tradition of including different lamppost designs with each Winter Village set, we have another one here. This time we have two Black SNOT bricks stacked on top of each other on the lamppost, with one of them serving as supports for the lamps. The other SNOT brick is uses to suspend the leafy plant part, used to represent a holly leaf – complete with holly berries – on the lamppost. 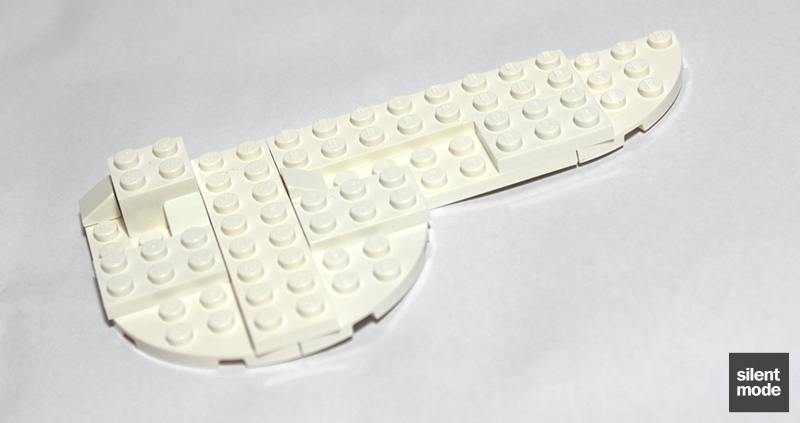 It’s an all right design, but may have benefited from a single SNOT brick with four studs instead of the two with two studs. …the little girl and the two small trees. Here’s the entire scene, and it really is a complete scene. One can imagine the rows of houses, maybe a frozen pond and some trees surrounding it, in the background. Quite a few spare parts are left, but nothing incredibly ground-breaking apart from the Bright Green flower plate. 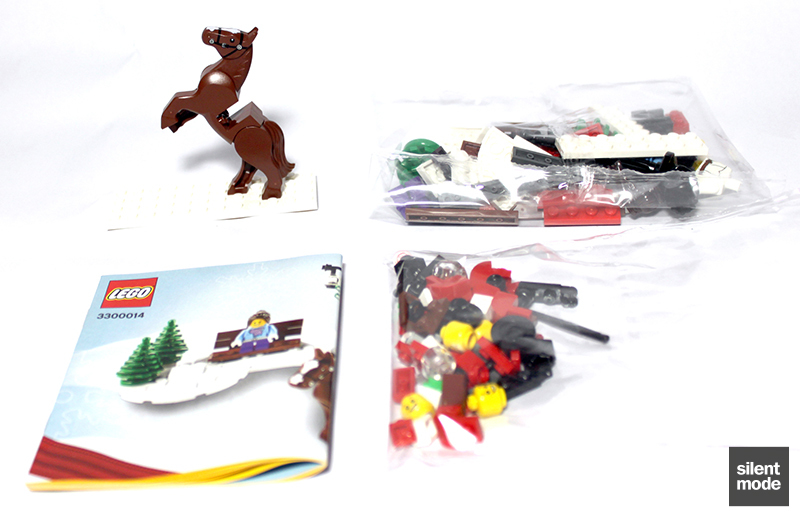 The 1×2 Reddish Brown brick is a leftover from the horse, assuming it’s carrying the sleigh. Other than the nice-looking covers, which match the box art, the instructions look exactly the same as any other set – though they match the yellow border, blue background design of larger instruction manuals. In all honesty, although I thought it was a nice set from the pictures that surfaced, I wasn’t as enthusiastic about it as most people were when it was announced. I saw this purely as a set I’d want to part out for the more interesting pieces, whatever they were. 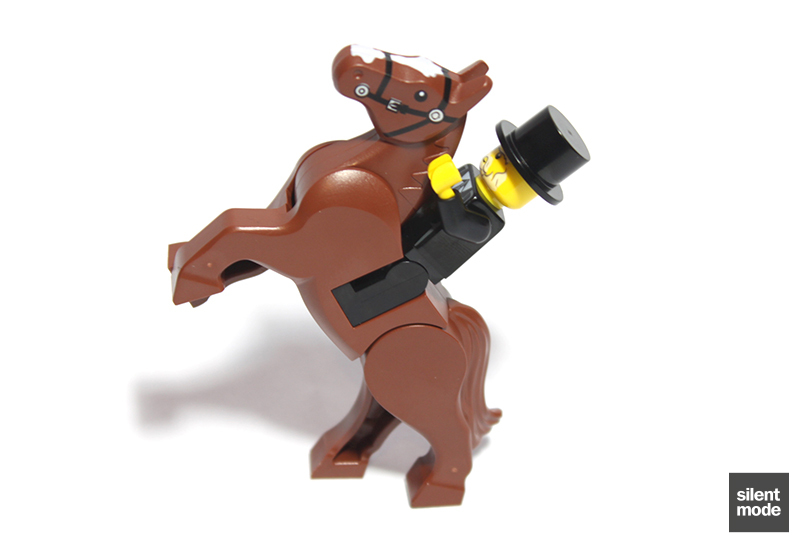 Having gotten the set at the VIP event preceding Brick Friday, my mind hasn’t really changed much. 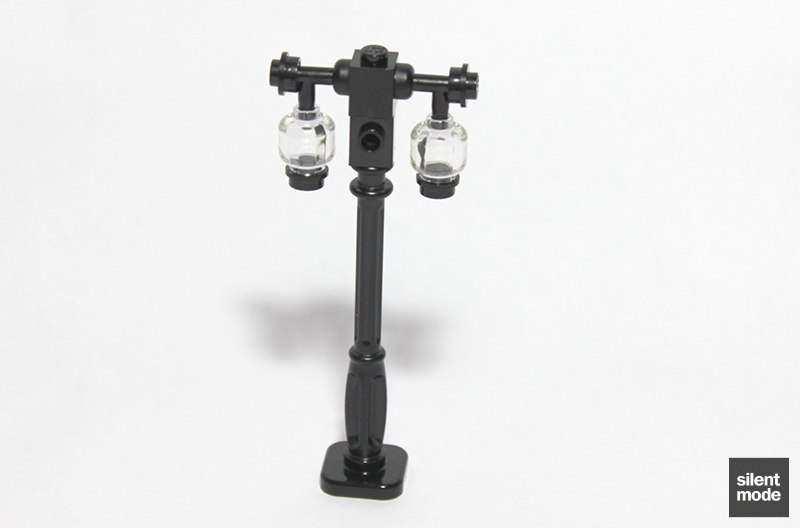 For me the highlight of this set is the lamppost, as well as the inclusion of four minifigures when a set at this price would usually have two at the most. Given that regular Red is the predominant colour in this set, I’d guess that the minifigures make up the bulk of the price, whereas it was the inclusion of Dark Red parts in last year’s promotional sets. I personally don’t have much use for horses, although this is a good opportunity to get hold of the new-style horse if you don’t have one. Where I will agree with other people is that it makes a very good inclusion in Winter Village scenes, especially if you have all four buildings. Even if the little girl has had a visible growth spurt, none of these figures would look out of place with any of the buildings. As with last year’s Holiday sets, there isn’t going to be an overall score or rating. However, I would rate this set as being right between Holiday Set 1 and 2 in terms of desirability. If I do get hold of another one, it would be to put in the vault. Here’s to a Merry Christmas, and the most Christmassy image I could think of at the moment. See you in 2013.